A study by the Trust’s Deputy Director, Dr Jack Bloomer whilst at Southampton University suggests that the membrane of salmon eggs may evolve to cope with reduced oxygen levels in rivers, thereby helping their embryos to incubate successfully. The research, funded by the Environment Agency and published in the journal Royal Society Open Science, has found that differences in the structure of the thin film surrounding a salmon embryo affects its ability to absorb dissolved oxygen from river water. Atlantic salmon are in decline in their natural habitats and it’s thought this is partly due to a reduction in the quality of the water in which they spawn. Sediments washed off the land can starve rivers of oxygen by encouraging more organic matter to grow and silting up the gravel beds where salmon lay their eggs in nests (redds). The eggs rely on a sufficient flow of oxygen across their membranes to successfully incubate and this latest study examines how the structure of these membranes vary in different salmon populations. 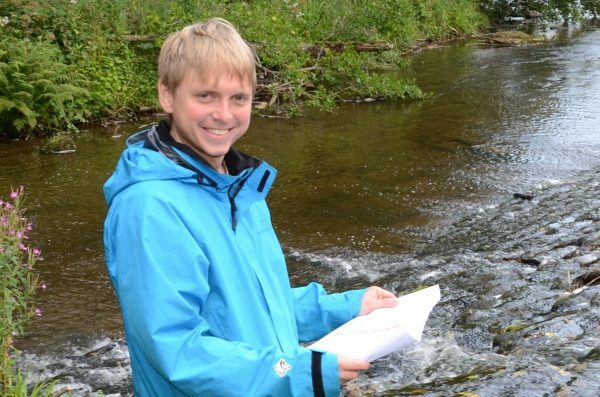 Jack took a range of measurements from membranes of eggs at a fish farm in Scotland and from conservation hatcheries in four different UK rivers; Dorchart, Tilt, South Tyne and North Tyne. They were chosen for their varying levels of sediment and oxygenation. The results showed membrane thickness, porosity and permeability varied according to each location. Further tests on eggs in laboratory controlled conditions showed that those with less permeable membranes were less likely to survive low-oxygen conditions – in other words, the thicker the membrane, the more likely the egg will be starved of oxygen and perish. Conversely, greater permeability means a greater chance of survival. Jack undertook the research while a PhD student in the School of Geography and Environmental Science at the University of Southampton, he says: “Our findings tell us that the permeability of salmon egg membranes differ according to their location and that their structure affects how efficiently they can receive oxygen from the water around them. Professor David Sear, also of Geography and Environmental Science at Southampton, was the lead supervisor on this research, working with colleague Professor Paul Kemp of the School of Engineering. Past research by Professor Sear examined how fine sediments from soil erosion, farm run-off, road verges and eroding river banks can accumulate in the nests of Atlantic salmon and other benthic spawning fish. He comments: “We’ve previously shown that reduced oxygen supply to the incubating embryo, due to increased fine sediment accumulation in spawning gravels, contributes to the decline in fish numbers in UK and European rivers.